IET Venues has announced that its Glasgow: Teacher Building has achieved carbon neutral status through the Carbon Trust and the Green Tourism Business Scheme. The achievement means that all events and delegates at the venue will have their carbon footprints offset while there. The venue has worked with Carbon Clear to reduce its emissions as much as possible and offset the remainder through 'credits'. IET Glasgow: Teacher Building has also participated in National Energy Saving Week in October, which involved it giving employees advice on reducing their own carbon footprints. Justin Livesey, IET Glasgow: Teacher Building’s venue manager, said: "Offsetting carbon is not something that should just be confined to transport and travel. At IET Venues we’re fully committed to doing our bit for the environment and reducing the impact we have on it. "The acknowledgement that IET Glasgow: Teacher Building is carbon neutral should give peace of mind to all of our customers and delegates that the environmental impact of the events they’re running or attending has been offset by us." 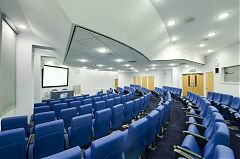 IET has venues in Glasgow, London and Birmingham.